The way you look in life determines how you see problems. If you see them only as an annoyance, you will develop an attitude of bitterness, selfishness, and hopelessness that will make you want to give up. However, if you see your problems as an opportunity to grow and strengthen your character, you will be able to conquer all of them, rise above them and persevere to see what good things and beautiful gift has in store for you. 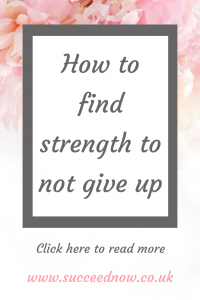 Here are some helpful tips on how to find strength when you are tempted to give up in life. I hope these tips will help you find some motivation,inspiration, and the STRENGTH to keep going. Try to recall all your dreams that have set you on your path. What was the idea that got you started at the beginning. There were times in my life, when I almost wanted to give up. With too many personal issues and school hardships, I got so exhausted with too much drama and pain. Some of these included but not limited to relationships, personal finances, and finishing nursing degree at the same time. With all of these problems happening at once, I wanted to give up my dream of becoming a Registered Nurse. However, at those difficult times and suffering, I asked myself, will it be worth if I give up? What will happen if I give up? What else should I do if I give it up? At that moment, I recalled my goals and dreams. And then it came to my realization that all those sufferings are obstacles that I have to deal with and conquer to get the result that I want from the beginning. Recall your goals and dreams. These will motivate you and give you the endurance to keep going no matter how difficult the situation is. Sometimes it’s difficult to challenge yourself when life is tough, but remember you are stronger than you think. Remind yourself how amazing and how capable you are. When everything seems to fall apart, and when things is not working out, remember to remind yourself that you are brave and you are capable. Don’t allow your fear to let you down. Instead, let that fear challenge you and it will make you become positive to keep you moving forward. Make some space for yourself. Sometimes when we get exhausted from work, family, marriage, relationship conflicts, or even financial issues, we tend to forget to give some time for ourself and it leads us to negativity and tempts us to give up on our dreams and goals. Don’t be too hard on yourself and stop beating yourself up. Yes, we want to give everything our best and carry out things, but sometimes pushing too hard can make us feel exhausted. When these things don’t work out no matter how we tried, we become disappointed, bitter, and hopeless. I’ve felt all these things before. However, learn and find some time to give yourself a break, and when you do. You may find peace, happiness, and loving yourself more and the strength to keep going. Remember, It’s OK to rest and give yourself a break but NEVER GIVE UP. Sometimes, the reasons that give us inspiration to make our goals and dreams can also be the reason that make us feel hopeless and broken. We become tempted to give up. They are maybe the person you love, your family members, or even yourself. If these inspirations makes you feel hopeless and tempted to give up, then find some inspiration from others, who achieved their goals despite of the struggles they faced in their lives. Here are some of the greatest examples of people who failed but NEVER GIVE UP and succeeded. – J.K Rowling – Her first Harry Potter Book were rejected dozens of times until it was finally accepted by Bloomsburry, a small London publisher. Her story is one of the most inspirational successes. Her life was not a bed of roses. She struggled before she become successful, and now she is the most successful female author in the United Kingdom. – Oprah Winfrey – Dealt with criticism, racism, and reportedly a victim of sexual abuse, but she persevered, earned a full scholarship to college, and worked her way out to become an International superstar and a creator of her OWN network. – Bill Gates – He suffered failure in business but it didn’t discourage him from trying again. As a result, he achieved success in his Microsoft business leading him to become one of the wealthiest men in the world. – Thomas Edison – We’ve all heard of his name. He failed over 10,000 times as an inventor. Due to his drive to succeed, he would come to invent a commercially viable electric lightbulb. He is someone who refused to give up no matter what. Take a breath, and spread your wings! Believe in yourself, and give yourself permission to succeed and be proud of every achievement you make even it’s a small one. Write all the things that you’ve done well and celebrate. Count your success, instead of being dissatisfied from the things you haven’t done. Yes, we all make mistakes, but don’t let the mistakes of the past and criticism stop you from achieving your dreams and goals. Instead make it an inspiration to keep going. Trust yourself that you can do great things. Build a great relationship with yourself. Learn to trust your own potential and allow yourself to create self-love. Trust yourself, because it’s the best thing that you can give to yourself. If you can’t find the strength you need, find a reason to keep going. You are limitless, you are one amazing person, and you will make it! Remember, life is not meant to be easy. If there’s no obstacles, there’s no progress. Best of luck on your journey to confidence, self-love and success. I hope you now know how to find strength. The life of your dreams is yours! I love these ideas! Great list! I really needed to read this! I’m gonna sit down and write all my inspirations so i can get re-movitated with my life lol!! I love how motivational this post is, Reading this today and I am inspired to keep doing what i love! Thanks for the inspiration! I needed to read this. Sometimes it’s hard to get through hard times and find a positive mindset, but remembering why we’re here in the first place is the best reminder to keep going. Thank you for this. This month I encountered a big change in my life and I just wanted to give up. I just thought of the positive things that will happen and I believe it just gets better each day! What a great list! I have such big goals and dreams that it can sometimes get frustrating when I don’t reach them. I have to remember to keep pushing and never give up even when I feel like it. Thank you. Ready to take control of your life and feel FREE? Get instant access to 6 experts to manage feelings, build confidence and improve self-love. I'm so proud of you for making this decision to take control of your life. Time to start putting yourself first without feeling guilty? Are you ready to get all the amazing benefits of self-care? 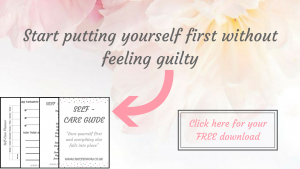 This FREE guide will get you started on adding self-care into your life for instant results!